Let’s talk feathers. Light as a feather, feather in your cap, feathered pillows, feathered hair. I’ve been collecting bird feathers since 1984. I find them on long walks through the woods; I find them in the sidewalk cracks along city roads. Feathers have been used in every culture since the beginning of time. In South American headdresses, feathers are a status-symbol, worn on ceremonial or ritual occasions. The head is to be protected and respected. It’s where the Soul or Spirit resides. The Fool archetype in the Waite-Smith Tarot deck sports a red feather. In many Native American cultures, feathers are sacred, a universal symbol of Spirit and flight. And feathers adorned headdresses, Talking Sticks, and pipes. Quetzalcoatl, the god of human sustenance, penitent, self-sacrifice, and re-birth was portrayed as a snake covered with the iridescent-green feathers of the quetzal bird. These feathers also made up the insignias of Mexican kings. In some depictions, he wore a headdress made of black crow and red macaw feathers, a reference to the Night or Dead Sun. Each feather in the headdress signified an act of bravery. In Wiccan culture, different colored feathers represent different magical qualities. Green feathers symbolize money, prosperity, and growth. Red are for vitality and courage. The eye on the end of the peacock tail feather stimulates clairvoyant vision. The rooster’s two prominent tail feathers (called sickles) are symbols of the God and Goddess. It was pharaoh’s job to uphold Maat. When a pharaoh died, Maat was lost and the world was flung into chaos. Only the coronation of a new pharaoh could restore Maat. The Egyptians believed Ieb, the heart, was the center of all consciousness, even the center of life itself. When someone died it was said that their “heart has departed.” It was the only organ that was not removed from the body during mummification. In the Book of the Dead, it was the heart that was weighed against the Feather of Maat to see if an individual was worthy of joining Osiris in the afterlife. Many writers tells stories of feathers. 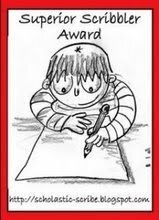 In the children’s book Dream Feather by Viento Stan-Padilla, a little Indian boy hears a song drifting down from the sun. Ancient stone etchings on cave walls foretold that a feather would be his guide. If he followed it, he would return to the Source. And if you have read Mary Oliver’s book Owls and Other Fantasies: poems and essays, you have seen the delicate and detailed photographs of feathers taken by Molly Malone Cook. What do feathers mean to you? Do you pick them up when you see them, recognize the polka dots of a Flicker feather, brush them away when they fly out of an old down comforter? Have you ever been in love and felt light as a feather? Did your grandmother wear hats with feathers? Do you insist on sleeping on a feather pillow. Have you ever studied a feather’s design while holding it up to the sun, seen an ostrich feather in your family coat of arms, stuck a feather in your cap and called it macaroni? The last time I saw a feather…. If you get stuck, remember what a feather looks like floating on the wind. Go to one of the many feather links in this Topic post to jog your imagination. Or make a point to notice the cardinal at the afternoon feeder, pecking at a black oil seed. And the way her tufts blow in the winter wind. Shield Of Courage, art by QuoinMonkey, all photographs Minneapolis, Minnesota, November 2007, photos © 2008 by QuoinMonkey. All rights reserved. 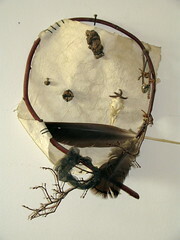 Courage shield was created out of handmade paper, bent red willow, feathers, bone, brass, wood. 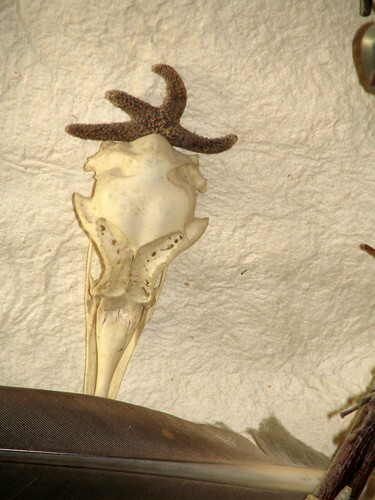 I was told the skull was cormorant by the person who gave it to me. Feathers are Canadian Geese and Wild Turkey. The art was created in the early 1990’s for a papermaking class. The paper was made by hand out of the brown bladelike leaves left on Minnesota Day Lilies in the Fall. I always pick up found feathers..I once read that is a gift. Thank you for your sharing your gifts with us! gypsy-heart, I’m so glad you leave your notes for us! Found feathers are a huge gift. I’ve got quite a few rare ones. When I first started collecting them, they started appearing everywhere along my walking path. And people would find them and give them to me. When I was really into it, a friend of mine’s dad went on a trip to Africa and while he was there, he collected the feathers that he saw for me. I couldn’t believe how many there were, and some rare bird feathers, too. He said once he started opening his mind to looking for them, they just started appearing everywhere. I think that was true for me, too. It’s so easy to walk along and not notice the little things in nature that are presenting themselves to us as gifts. A person on red Ravine recently commented on having seen a hawk devouring a jay (like in the Galway Kinnell poem I did a post on last year). The feathers were flying. And I often see places along trails full of feathers from foxes, owls, hawks, and other raptors killing their prey. Anyone who has never felt the down of an owl feather is sure missing out on something amazing! LB, wow, a necktie out of feathers. Now that’s something I haven’t seen before. I was very inspired by the links in this post, all the ways different cultures use feathers. And these were only the tip of the iceberg. For many, feathers are sacred territory. What’s great about found objects in nature, like rocks, feathers, and bones, is that they can be so inspiring for a person’s art and writing. When I find these little gifts, I bring them home and keep them by my writing spot or my computer for a while. To see what they have to teach me. I only did one of the three writing practices suggested in the post. I plan to do the others. I also didn’t click on any of the many context links provided, which I think will be helpful in getting juices flowing. Quetzalcoatl is especially intriguing to me — I studied this mythology when I was a student of Latin American Studies. QM, is your Shield of Courage hanging in your home? It has held up well given its age and the fact that it’s so hard to keep sculptural art well-preserved. Hey ybonesy, weren’t you going to scan some of your feathers and post them? If you are able to do that, I’d love to see how the scanner treats the details of them. I’ve photographed feathers sometimes. It’s difficult to capture their true essence without the right light. Yes, I plan to write more about feathers in the future. Or maybe do some postings of images of them. It would be cool to read a post on Quetzalcoatl. I am curious about your interpretation of the mythology after your Latin American Studies classes. The Shield of Courage was something I created early in my art school years. I knew very little about art history or the Fine Arts when I started school that year. I came from a Media Arts background and knew a little about Fine Art Photography. But had a lot to learn about the rest of the Visual Arts. There were so many art students who seemed way ahead of me when I first went to art school. I was just learning to draw and just beginning to study art history. I created the shield and they added to it to give me strength and courage. It was a cool thing. We all kind of supported each other in that way. Community. I photographed the turkey feathers that were out front stuck in the TURKEYS FOR SALE sign, but I didn’t scan them. Scanning would be pretty cool. I’ll have to give that try. I wish I had some other feathers to scan, but for now the only ones we have in abundance are turkey. I don’t save feathers. They seems so light and meant to let go, so even the girls’ peacock feathers, which we put into vases around the house for a few weeks or months eventually get let loose outside. Maybe it’s my upbringing — that notion that objects found in nature should stay outside in nature. Maybe I’m just making up the excuse that feathers look like they want to fly in the wind outside 8) . I have to say, Jim and the girls will bring indoors rocks, pieces of metal, feathers, wood, old cactus spines — just about anything. We were always in battles where I insisted all the natural items stay outside, and we finally settled on creating rock gardens here and there around the yard. To me, all that nature indoors, on tables or windowsills, feels like clutter. Yes, it sure can create a lot of clutter. I think that’s why I keep most of it in boxes right now. I’m trying to decide what to do with it. I got rid of a lot when I moved. But what do you do with the spiritual gifts that people have given you or you’ve collected over time. I’ve got fetishes from New Mexico that I’d like to put out. Those I won’t be letting go of. And a few of the rare feathers I will keep. But some of the other – I need to go through it all. There is something to be said for keeping nature outside where it comes from. I sure don’t think you are alone in that. Hey, I like your idea of letting the feathers go back to the wind. Maybe when I let go of some of my feathers, I’ll do that over a cliff or out over the rivers here. I like thinking about all those feathers floating back into the sky. If I were to keep found objects, I’d probably organize them in a shadow box. I love to see multiples of one type of object. You can actually get found objects framed at certain places in that way, although it’s probably pretty pricey and you can do it yourself, I’d think. If you use them in art, keeping them in bins in your studio would be a great option. Our rock gardens are fun to create. We place really cool rocks, shells, wood in it. Pretty glass. I’ve bought fetishes for the girls over the years, and when I used to travel to places like South Africa or China or India, I always tried to bring back something carved from stone or wood from there. Even displaying those is a challenge. They get knocked over and break easily. If you find a great way to display your fetishes, let me know. A shadow box is a good idea. I think you’re right about displaying found objects – a plan is needed in order to have it not look like clutter. The rock garden is the way my two friends are going in their yard, too (they are the ones with the yard by the pond in the circle haiku post). One of them is a mad rock collector. So they finally created a rock garden outside and now they put their faves there. On the fetishes, I’ll keep you posted. I have a friend who displays hers on a high window sill in her entry way. Fetishes can be shy and sometimes like to be a little out of sight. The rest of her things she has arranged in a built-in buffet. They are common in the older homes here.